The Indians struggle to reach the basket as the Blue Jays intercept. Indian River lost to Seaford in overtime, 50-46. 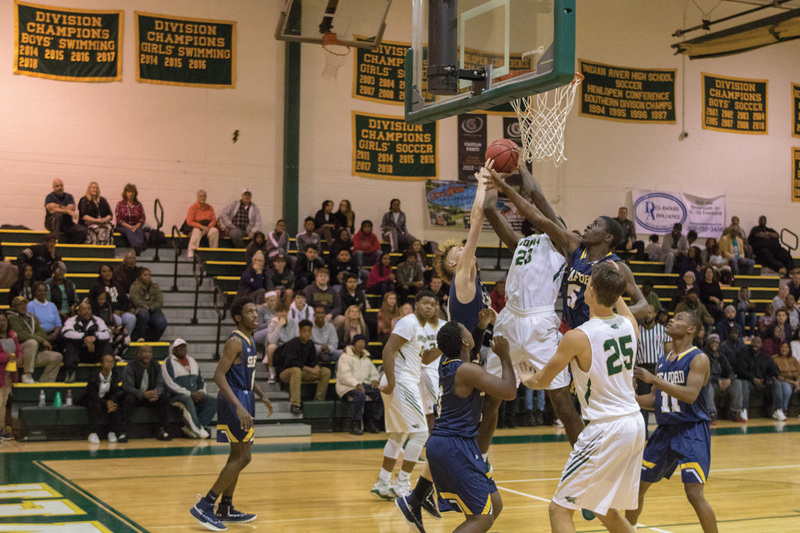 But on Tuesday night, Dec. 11, was something they had yet to face during the early parts of this young season, and they weren’t able to defend their home court, falling to visiting Seaford in overtime, 50-46. Jamier Felton and Michael Meehan led the offensive effort for IR, with 14 and 13 points, respectively. Seaford’s Da’Jion Garrison scored a game-high 17 and was the lone double-figure scorer for the Blue Jays. IR’s inability to hit free-throws throughout the entirety of the game — but, more importantly, in the closing minutes of regulation — was an absolute killer. The Indians connected on just 13 of 26 attempts at the charity stripe, including going just 8-for-15 in the fourth quarter alone. IR did indeed have a chance to win it, and actually held a two-point lead with less than a minute to play in regulation. However, an ill-advised three-point shot led to a transition opportunity for Seaford at the other end, and they were able to connect on their free-throws to force the extra stanza. IR trailed 25-20 after the first two quarters, and by just one point at 37-36 after three. The Indians out-scored Seaford 10-9 in the fourth, while also holding that late lead. Meehan hit the first of two free throws with :24 left, to make it 46-43, but following Meehan’s missed second free-throw, Seaford responded with a layup the other way. Isiah Lake missed both ends of his visit to the charity stripe. He would rebound his second attempt and was fouled again with :02 left on the clock. He converted one of the free throws to tie the game at 46-all as time expired. The Indians failed to score during the overtime period, which resulted in the loss. They had little time to dwell on the setback as they were set to head down to Delmar (1-2 overall) to face the Tigers on Thursday, Dec. 13, after Coastal Point press time. Results of that game will be found on our Facebook and Twitter pages.